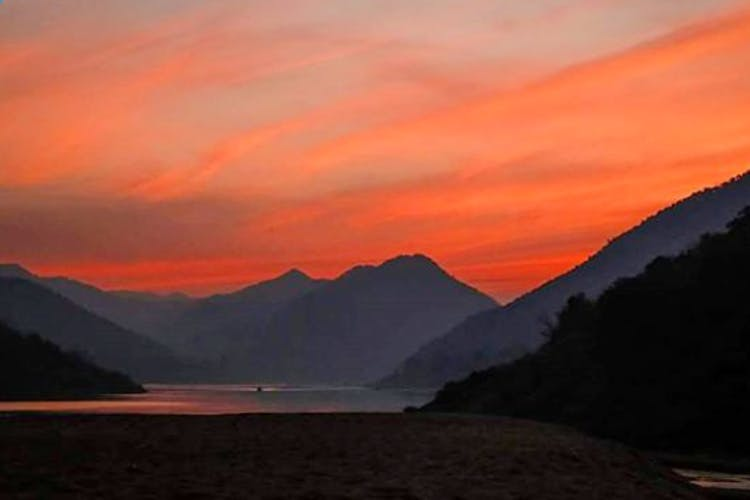 Papikondalu (also known as Papi Hills) is a series of mountain ranges in the West Godavari district of Andhra Pradesh. Ferry through the Godavari river over a boat and explore the hidden beauties of Rajahmundry. Surrounded by lofty hills on either side of the river, Papikondalu is a popular getaway in Andhra Pradesh. Thousands of visitors ferry across the river to reach Bhadrachalam – a town known for its 17th-century temple of Lord Rama. If you’re looking for a quick weekend getaway, not too far from Hyderabad, we recommend this because it comes with exciting activities like night camping, stargazing, and exploring the ebbs and flows of Godavari. The boat (or launch) ride begins in Rajahmundry taking you through Pattiseema, Polavaram Project which are located quaintly between hills. While dashing through these hills, you’ll witness beautiful sunsets but it’s the night stay at Kolluru Island that will blow your mind. The stay at this island is arranged in quaint bamboo huts with a view of the river on one side and the forest on the other. With no network connectivity here, you'll unplug from Snapchat and bask in the moonlight. The next morning, you can set off an on a walk from Kolluru Islands to explore areas like Pamaleru Vagu, a riverside village that also abounds in greenery. With a good pair of walking shoes, you are sorted to check out the close by villages and locations that’ll make your Instagram followers seethe with envy. We also loved our meals here – a true Godavari indulgence. While the authentic vegetarian delicacies will fill your tum, we’re looking at the sea-food lovers who’ll love fish fry and prawn delicacies. After a quick hike to the areas in the vicinity, the launch will take you back through Papikondalu back to Polavaram. From there, you could either book yourself a cab/bus ride to reach Bhadrachalam or go back to the city. There are plenty of tour operators who handle the boat rides to Papikondalu. Your choice of picking one should depend on how many days you can devote to the trip and which locations you’d like to tick off your bucket list. Getting there: You can take an overnight train or a bus to Rajahmundry, from where your trip begins.